The NRS High Tide Jacket is a single layer smock-style paddling jacket It is made from 40 denier HypoTex fabric which is waterproof and windproof, and allows moisture and perspiration to transfer through the fabric while maintaining its waterproof and windproof properties. The wide neck opening makes it easy to get on or off and the half length zipper is non-corrosive. There are also two handy (splash-proof!) sleeve pockets that are accessible when you are wearing a PFD. Colours are bright for good visibility on the water - Citron (fluoro yellow) and Fern (green). When you are not wearing your jacket it is lightweight enough that it is compact to stow. This jacket is a good entry-level lightweight (or summer-weight) paddling jacket for kayakers. Its smock style is comfortable and it comes in a wide range of sizes (small to XXL). This paddling jackets tick all the boxes! The Kokatat Goretex Passage Anorak is made of breathable GoreTex fabric with a stretchy neoprene waistband that can be tightened to fit using velcro tabs and has a double layered skirt to fit around your spraydeck waist tube. 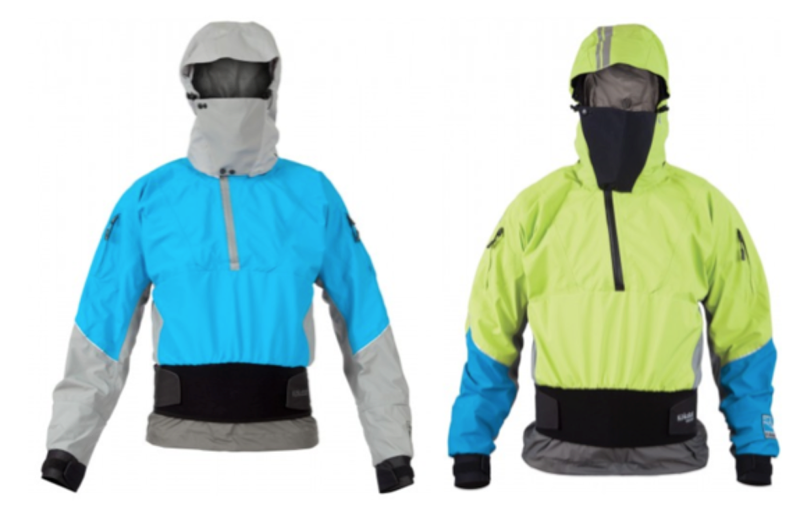 It is a pullover style jacket, with generous neck zip and storm flap to keep off the spray, and a wide-brimmed hood to keep the rain off and wind off the back of the neck. There are reflective patches on the sleeves and bellows pockets (pleated - they expand!) on the sleeves with clips inside so you can lanyard to them. Latex seals on the wrists keep the water out. The Kokatat Passage Anorak has the same construction and features of the Kokatat Tectour Anorak (pictured in the gallery below) that it replaces, which has given me good service over 4 years in a commercial (hard use!) setting. Colours for Kokatat Passage Anorak are vibrant blues and greens. The Passage is the rolls-royce of paddling jackets - definitely a quality product. It is comfortable in bleak conditions and being breathable is comfortable on windy days even when not-so cold! A fantastic jacket for both work and play.